Martha Rosler’s “The Artistic Mode of Revolution: From Gentrification to Occupation” is a piece that analyzes the components and consequences of gentrification, and the contemporary entanglement of artists, the “creative class”, and Occupy movements, with a particular focus on the United States. After an introductory record of protests and Occupy movements by young people (mostly University students or recent graduates) facing a shaky job market, Rosler establishes a comprehensive history of how the creative class came into formation. Its roots are in the churning institution of the University, and its role, as named by the head of the University of California in the 1960’s, as a “site for the production of knowledge workers” (knowledge in this case being synonymous with information). These “knowledge workers” become the creative class, a term made popularly viable by Professor Richard Florida, a social theorist. Florida’s creative class lumps together any worker whose “mental engagement” is at the heart of their workplace production. It would seem that lower-earning individuals such as artists become the face of this creative class, but higher-paid workers reap the policy-driven benefits. This phenomenon runs parallel to the “Soho model” of Urban planning, which is the fitting of large, industrial buildings into studios/ artist residences. Once a neighborhood is made fashionable by the the low-paid artists who inhabit these industrial spaces, a higher-earning class of people gain interest, raising property value and generating the presence of condominiums and chain businesses. Rosler insists that artists do not wish to be inserted into this recurring mode of capitalist action, which is where Occupy comes in. As Rosler puts it, “The creative classes as constructed by Florida operate strictly within the world view pictured by the capitalist imaginary.” They are an idealized image, a hologram, and as such are without real agency. Through the literal occupation of space, Occupy allows unrepresented parties to create new kinds of publics, outside of capitalist delineations and institutions. Most (all?) of public space is capitalist-controlled to some extent, but Occupy’s assertive bodies shape anew the potentiality of public space. I believe the people, through the recouping of space, reclaim agency, as movements like Occupy take back public space from its prescribed, static confines. Protests like Occupy show the political possibilities of public space, as well as its merely physical potential. City landscapes become active, instead of passive. They are no longer stagnant sites, shifting in front of one’s eyes by the actions of people at last visible, instead of only through intangible policy. The heart of Rosler’s article is the campaigning for the agency and visibility of marginalized persons within the urban landscape, and the unspoken enemy thereof would seem to be, ultimately, gentrification. It is interesting to consider gentrification in terms of Toronto’s neighbourhoods, the most urgently shifting grounds I can think of being West Queen West (and Parkdale, west of the Dufferin bridge). In the first half of the twentieth century Parkdale was a desirable location, close to the shorefront and its resident amusement park, and littered with grand brick houses North from the lakeshore towards Queen St West. The building of the Gardiner Expressway meant traffic, noise, apartment buildings, increased population density, and overall a less desirable envioronment. Soon after, in the 1970’s, thousands of patients were released from the Queen Street Centre for Addictions and Mental Health into South Parkdale (Slater). As recently as ten years ago, Parkdale was a mostly low-income neighborhood, populated by working class individuals, its streets a blend of diners, dive bars, and halfway houses. The low rent meant the insertion of lower-paid artists into Parkdale, and, further east, loft conversions of industrial buildings à la the Soho model of gentrification, plus the opening of the famed hipstitution, The Drake Hotel. 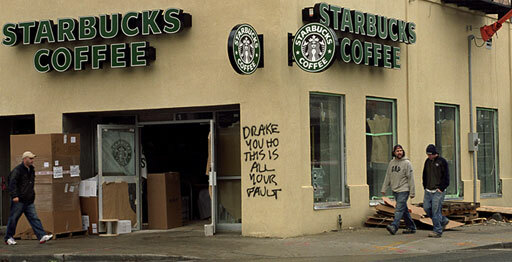 The corporate ramifications of the The Drake’s injection into the neighbourhood can be seen in the image below of Queen St. West and Dovercourt. Recently, condominiums are being built in West Queen West and in Parkdale, and a Starbucks has shown up in the Deep Parkdale area of King and Dufferin, sure signs of yupsters gaining an urban stronghold. Rosler referred to this new breed of yuppies as simply yuppies, but I would assign them the colloquial yupster moniker, meaning the unholy permutation of the hipster and the yuppie. These are not the previously cited artists, but young urban nouveau-bourgeoisie, reaping the benefits of the “cool” surroundings formed by an artistic population. Recently, West Queen West was touted the second-hippest neighbourhood in the world by Vogue Magazine. One wonders what is next for Parkdale, and its increasingly marginalized and subjugated inhabitants. Rosler is without a doubt in the artist’s corner, being a successful one, but is also conclusively campaigning for the visibility of “neighbourhood advocacy groups, immigrants’-rights groups, and working-class labor groups” through movements like Occupy. It is unclear where she sits in all this, except to eventually advocate for “alliances” of the abovementioned parties. I suppose the concluding question up for discussion would have to be: Whose fault is gentrification (I don’t presume to infer that it is the fault of the artist), and what is at stake for neighbourhoods such as Parkdale and their residents? Rosler, Martha. “The Artistic Mode of Revolution: From Gentrification to Occupation.” 2012, e-flux. Slater, Tom. “Toronto’s South Parkdale Neighborhood: A Brief History of Development, Disinvestment, and Gentrification.” May 2005, Research Bulletin, Centre for Urban and Community Studies.